In order to explain this concept quickly and concisely, consider the following three categories. Debating Concepts: Debating, arguing, or any behavior designed to undermine or defend a concept is an incentive behavior that is often verbally-combative in nature. Concept Advocacy: Proselytizing, preaching, persuasion, propaganda, or generally any behavior designed to promote a concept. Concept Analysis: Analysis, exploration, development, refinement, presenting, observation, and consideration of concepts is a broader behavior which explores concepts without the goal of promoting or undermining a specific concept. The above behaviors are sometimes all treated as the same type of behavior, with similar goals, incentives, and methods of approach, however I find that these are quite distinct behaviors. 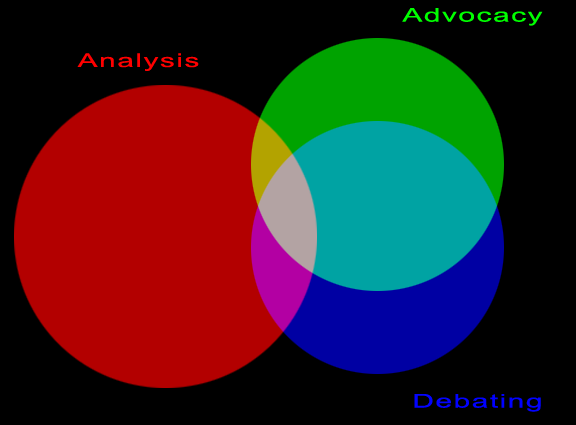 The overlap between the above is primarily that all three usually involve concepts and communication, and the three are often labeled and categorized together in a semantic way.